The Service Provider Licensing Administration Form manages SPLA certificates in an EQuIS Database. The form is accessible from the EQuIS Registration control of EQuIS Professional. Administrators managing SPLA certificates, and licenses must have the EarthSoft.Forms.Library.44110.dll assembly in their EQuIS Professional folder and must be connected to an EQuIS Database with insert and update privilege on the ST_SPLA, ST_LICENSE, and ST_USER tables. The EQuIS Database used with SPLA may reference network license keys in another EQuIS Database (aka License Server Database, see Associating Users with SPLA below). However, the Server ID listed on the SPLA tab of the Software Registration control must match the Server ID referenced by the SPLA Certificate. To access the administration form, click on the Service Provider Licensing Administration button in the center of the control. The Certificates tab of the Administration form displays certificates currently installed in the EQuIS Database. To install a new certificate, click the "st_spla" button to the right of Add at the bottom of the form. From the open dialog, select the new certificate. Opening an existing certificate results in the certificate file being merged, with the existing certificate stored in the EQuIS Database. This allows revised certificates to be updated without affecting licensing and facility associations. SPLA certificates include the ability to manage EQuIS Network Licenses. 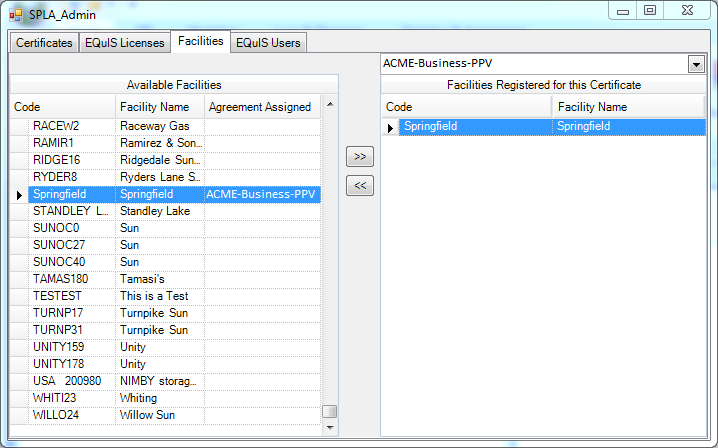 The SPLA Products Available section of the EQuIS Licenses tab shows a union of all products managed by all SPLA certificates in the database. 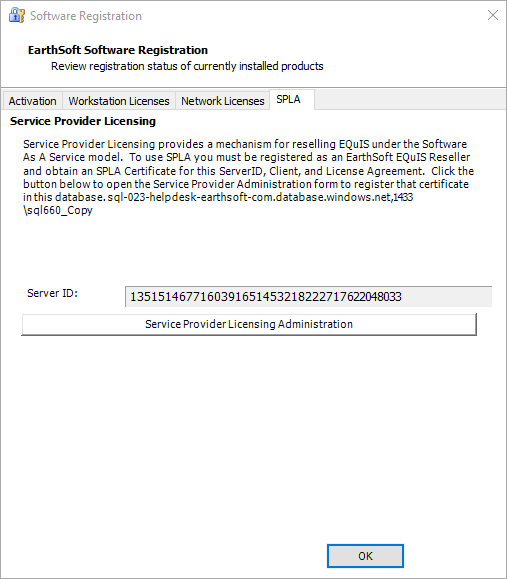 In this example, only EZView licenses are managed by SPLA Certificates. 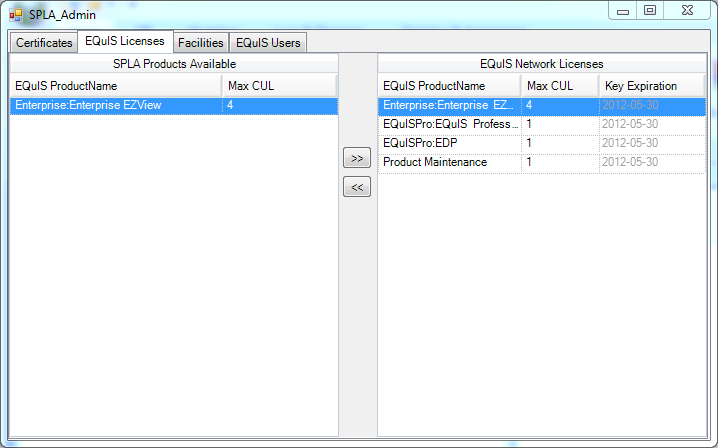 Add each SPLA Product license to the EQuIS Network Licenses set by clicking the >> button for those licenses to be available to EQuIS. Once listed under EQuIS Network Licenses, the number of concurrent licenses (Max CUL) of that product may be set to any arbitrary value if the product is participating in an SPLA agreement. In the following example, only the Max CUL of Enterprise EZView may be altered, because it is the only SPLA Product Available. If there is an existing product maintenance key that expires before the latest SPLA Certificate, product maintenance will be adjusted to the new date. The new date is the SPLA Certificate expiration date furthest in the future. All EQuIS Professional licenses managed through SPLA will be billed against the associated SPLA Agreement. Each facility participating in a Service Provider Licensing Agreement must be associated with the agreement before executing the Service Provider Licensing Usage Report. At least one facility must be associated with the agreement and it should not be associated with other agreements. To make this association, select the Facilities tab of the SPLA Admin form, and then select the agreement from the drop-down list in the upper-right corner. Select the facility to associate and click the >> button. Facility associations are stored in the certificate in the ST_SPLA table. 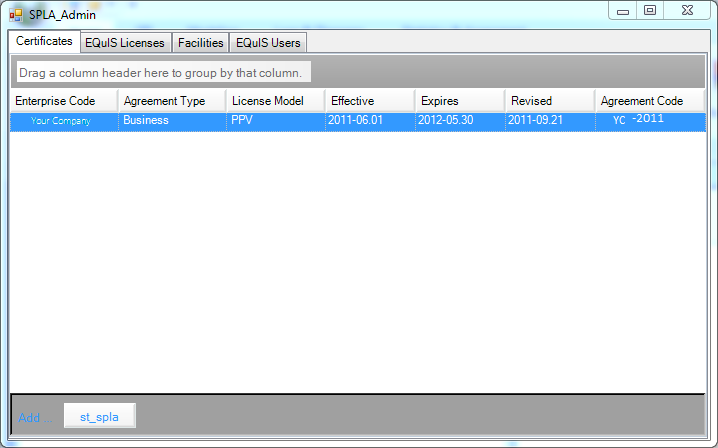 The last requirement for configuring SPLA is to associate EQuIS EZView users with the SPL Agreements. Set the value of ST_USER.ENTERPRISE_CODE to the same value as the Enterprise Code in the SPLA certificate. Users may participate in multiple agreements, but may be associated with only one Enterprise. The Service Provider Licensing Usage Report will count these users toward billing. Users with null as their ENTERPRISE_CODE are treated as overhead users and not counted toward billing. The number of overhead users should not exceed the number of billable users. Either disable the overhead users in exceedance of the SPLA or obtain a written waiver from EarthSoft. 1.Set up a License Server Database as explained here. 2.In each SPLA Database, add the record to ST_LICENSE such that the value in the LICENSE_SERVER field points to the License Server Database. 3.In each SPLA Database, review the ST_USER table. For external (SPLA) users, make sure that ST_USER.ENTERPRISE_CODE is not null. For internal/overhead users, make sure that ST_USER.ENTERPRISE_CODE is null. The logic for consuming a license will check ST_USER.ENTERPRISE_CODE for the logged in user. If the field is not null, EQuIS will disregard LICENSE_SERVER and use the licenses stored in ST_LICENSE in the SPLA Database. If the field is null, EQuIS will look to ST_LICENSE.LICENSE_SERVER to find the License Server Database.